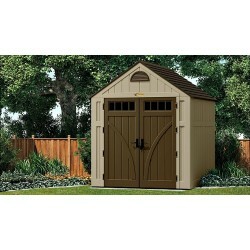 Shop our huge selection of resin Suncast storage sheds in many sizes and styles. Free Shipping on all orders! 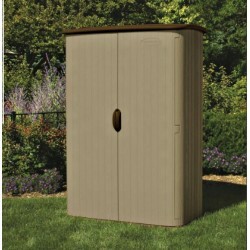 The Suncast 32 cu ft Storage Shed is great for use outdoors. Constructed of durable double-wall resin with wood grain texture. Convenient pad-lockable front opening and easy bolt secure assembly that requires minimal tools. Vertical Outdoor Shed, Tall with Wide Double Doors. It is made of Durable Blow molded Resin Construction with beautiful color Sand with dark brown accents. It includes sturdy floor and shelf support (Shelf not Included). 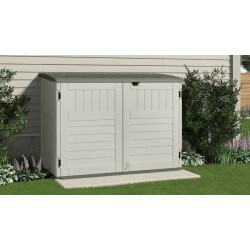 The Suncast 70 cu ft Stow-Away Horizontal Shed BMS4700 is an attractive storage container that protects your belongings while complementing your outdoor decor. Perfect for both lawn and garden. It has convenient pad-lockable front opening and easy bolt secure assembly that requires minimal tools. Suncast Vertical Sheds are a just-the-right-size storage option because they fit in places other sheds can't. 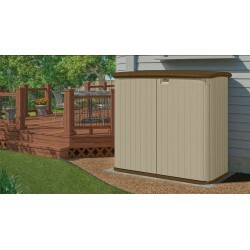 With its large and convenient profile, this shed offers plenty of room to keep your outdoor seat cushions, tools, lawn decor and more while still sitting below most standard fence lines. Discover the storage option that’s right for you. With sheds and deck boxes in a range of shapes, sizes, and styles, we’ve got you covered. Add tasteful and functional accessories to complete your space, and you’ll have everything you need to create a beautiful—and perfectly organized—environment, inside and out. The Suncast 7x3 Sierra Resin Shed is the smallest of the Sierra Alpine series and offers the same charm as its bigger brothers or sisters. Featuring 1 transom window on each door the façade of the 7x3 looks the part and will sit well in any backyard. 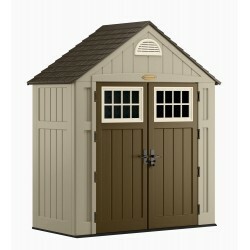 Store it Right with this 6' x 5' Resin Shed Built for all seasons, from the heat of summer to the snows of winter, this Suncast 6' x 5' resin shed features enduring all-weather construction, a reinforced roof and a stay dry design, so no matter what you choose to store, it’ll stay in great shape. 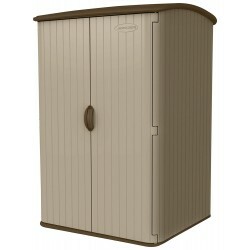 The Suncast 7x4 Cascade Shed uses blow moulded resin construction that consists of tough and durable double wall resin, finished in a wood grain texture giving these sheds a unique character that will enhance any property. You have storage demands, let the Suncast Everett™ Shed be the solution! With a large 306 cubic ft. capacity, there is little this shed will not store. 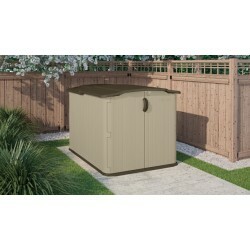 The 7.5' x 3.5' Suncast Alpine Shed is great for storing your lawn equipment and other outdoor supplies. The Suncast Shed is constructed with a durable resin and equipped with a large door that opens wide for easy access to items you use frequently. 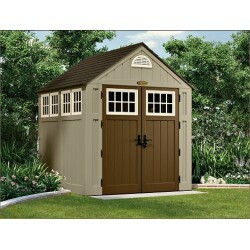 The Suncast 7x8 Sierra Resin Shed is a neat and solid little structure. 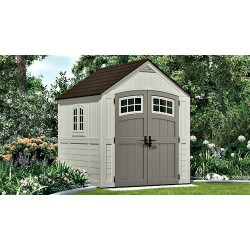 Featuring 1 transom window on each door, this shed has got great character and will look good in any backyard. 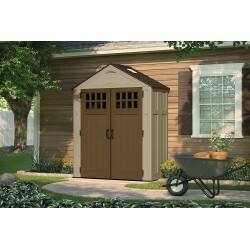 This Suncast Cascade Shed is designed to meet a variety of storage needs. It features tractor-tread reinforced floors for storing riding lawnmowers. 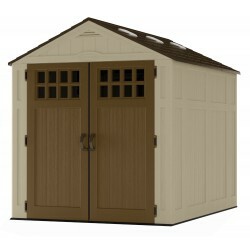 Each Suncast 7' x 7' shed also has wide double doors that grant easy access and the ability to store big, bulky items. 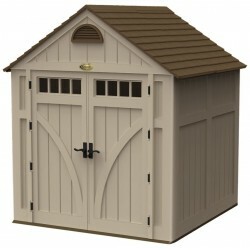 This Suncast storage building is sure to meet all of your storage needs. 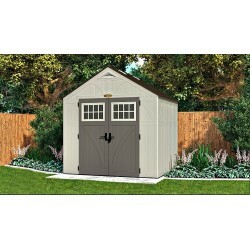 This shed features tractor tread reinforced floors for storing riding lawn mowers, heavy items and hold up to high traffic. Double doors grant easy walk-in access and the ability to store big, bulky items. 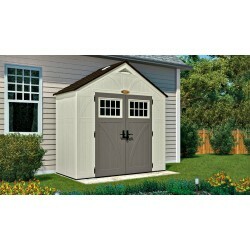 Take advantage of your backyard storage possibilities with this Suncast Resin Shed. 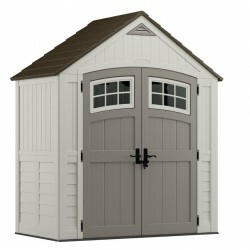 With an unassuming taupe exterior, the 7.5' x 7' Highland outdoor storage shed is great for storing your lawn equipment and other outdoor supplies. 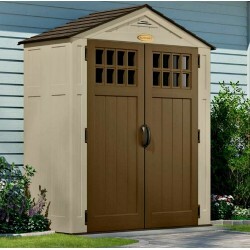 Add stylish storage to your backyard with the Suncast Alpine Shed. 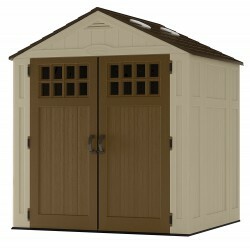 This 7.5' x 7' Suncast shed will give you a quality space to store all of your outdoor items.